Gone are the days of buying a simple jewelry box to hold your treasures. 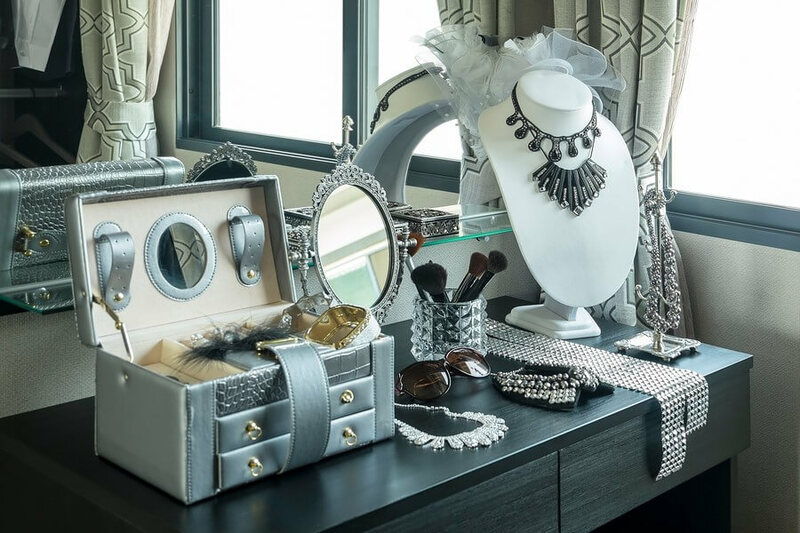 There are many choices for both fine and costume jewelry, and these include everything from a wall safe for your valuable pieces to a traditional box or display stands. Think of your fine jewelry as cash. Store your fine jewelry as carefully as you would cash. Remember the first place a thief looks for valuables is the master bedroom. Before you decide what organizer(s) to purchase, ask yourself a few questions and use the answers as a guide to choosing the best solution for you. How much jewelry do I have? How much is fine jewelry versus fashion jewelry? Where do I have room for it? Can any costume pieces sit on top of a dresser or vanity? Do I have wall space to hang jewelry if there is no other space available? Do I want it to be a decorative feature in my room? How do I want to protect my fine jewels? What type of jewelry do I wear most? Do I have specific pieces I wear often? If the answer is yes, consider a small easy-to-access organizer for daily use and an additional, larger organizer for everything else. Do I travel with jewelry very often? If so, be sure to add a travel organizer to your list and pick one up along with your main organizing system. Now that you have an idea of what is best for your jewelry needs, check out these top choices and pick the one or several that fit your collection style and size. Hanging Jewelry Organizer: This option is usually flat and can hang on a door or closet. Its see-through compartments are perfect for small items. Many also have loops on the opposite side for hanging necklaces. Traditional Jewelry Box: A jewelry box’s divided compartments are a great choice if you have mostly smaller items like rings and earrings. These boxes come in many shapes and sizes so you can pick what fits your needs. You can even look for one with a lock if you need to keep sneaky children away. While locking your jewelry box is smart, be sure to choose a more secure way to lock up very valuable pieces. Jewelry Armoire: This option is great for large collections and is typically the most expensive choice as well. Some are even disguised with a full-length mirror in the front, which can open up to reveal your treasures. Look for one with a lock for extra protection if you want to keep both costume and fine jewelry hidden away together. Jewelry Safe: For fine jewelry, consider a more secure place. Organizers are perfect for the inexpensive costume jewelry, but choosing a jewelry safe with fire protection is best for special jewels. Several options are available and include a small jewelry safe with customizable drawers, or even a wall safe that can come disguised as a mirror or artwork. Wall-Mount Display: This is perfect for the person who wants to see much of her jewelry at once. This mounts on the wall and has hooks so necklaces and bracelets can hang without getting tangled. These displays usually have a shelf for rings and earrings too. This is a great option if you don’t have a lot of space on a dresser or vanity for fashion jewelry. Plus, having your pieces hanging on a wall can be beautiful décor for a bathroom or bedroom. Jewelry Stands: These are also known as jewelry trees or t-bars and come in many styles to fit your taste. You can choose from one-, two- or three-tiered stands based on how much you need to display. These are perfect for someone with a lot of necklaces and bracelets, which need to hang. The base shelf is usually a good spot for rings and earrings too. Jewelry Trays: This option is perfect for the person who wants to reduce clutter and organize their items in a dresser or vanity drawer. It also is a slightly more secure choice if you have expensive pieces that should not be on display. The trays have different sized compartments for organizing all types of jewelry. Since they stack, you can get as many or as few as you need. Travel Cases: Be prepared for your next getaway with the perfect travel case. If your vacation includes some elegant occasions, look for an organizer with padding to protect your valuables. Also choose one with holes for earrings, and separate pouches or pockets so necklaces and bracelets do not tangle. Not only will a great organizing system keep your jewelry from damage, but it will help simplify your daily routine each morning. Choosing a solution that protects valuable jewelry is important as well. Consider going to the next step with personalized jewelry insurance from Lavalier so you can enjoy your jewelry and have the peace of mind you deserve. The 7 Best Jewelry Organizers to buy in 2018. www.thespruce.com. (accessed Nov 7, 2018). The 5 Best Jewelry Organizers. www.elitedaily.com. (accessed Nov 7, 2018).